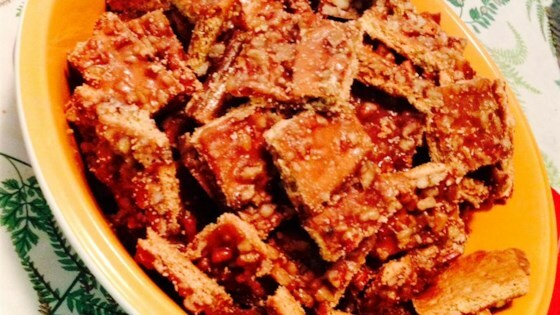 "Graham crackers or club crackers can be used as the base for the brown sugar-pecan topping." Line a baking sheet with aluminum foil and cover bottom of pan with graham crackers. Bring butter, margarine, and brown sugar to a boil for 2 minutes. Add pecans and vanilla. Pour brown sugar-pecan mixture over crackers; spread evenly. Bake in the preheated oven for 10 minutes. Cut while warm or break into small pieces. Puff pastry makes a tasty "shell" to hold creamy pumpkin mousse. Yum! When I make this recipe I sprinkle chocolate chips on them as soon as I take them out of the oven. Excellent! Very quick and tasty. Satisfied my late night sweet tooth without too much delay. I sprayed a cookie sheet with non stick coating instead of using the foil, and it worked quite well. Everytime I take these cookies to a party I am not allowed to leave without giving everyone the recipe! They are delicious and always a hit. Great recipe. My grandmother made something very simular when I was a little girl! Brought back great memories! Thanks for the recipe.